In today's episode, Lisette Sutherland from Collaboration Superpowers and myself talk about Engagement at Work, in particular in virtual teams. The emotional commitment an employee has to their organisation and its goals. 07:15 Lisette shares her updates, talking about the workshops she's delivering throughout the world! What do we mean by "engagement"? 13:50 The locus of engagement, what aspect of the organisation do we connect with? Locus of Engament: understanding what employees connect with at work. 15:20 What Lisette has learned from communities built around rock bands. Definition of community: a group of people aligned around a topic or solving a specific problem. What can we learn from communities? 19:55 Playfulness. Building a safe and tolerant atmosphere where experimentation is encouraged. 26:05 Sharing resources and spreading information. What do individuals look for from companies to help them stay connected? 33:10 Connectors. The importance of connecting people. 42:00 Give people equal attention. Know your people so that you can shape job descriptions around your people. Lisette mentions her interview with Ralph Van Roosmalen. 47:55 Virtuosos in the group. Recognition. 50:52 Office perks: care or control? How do we make sure that we bring out the best in each other? 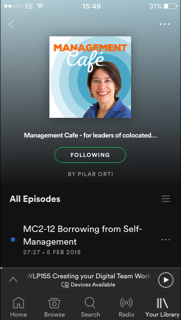 The main part of today’s show consists of Virtual Coffee with Lisette Sutherland, where we talk about engagement at work, specifically about those things we can do as managers or as members of virtual teams to bring out the best in each other. And listening to this conversation as I was editing it – which is one of the reasons while I still edit these podcasts, it’s a great way of listening back to then prepare this introduction – listening back to this chat with Lisette, I thought that one of the most difficult things to do, to create this engagement, this emotional connection with the work, is to create an environment, a culture where it’s all right to fail and make mistakes. But dealing with the failures and mistakes of others is also quite difficult. For a start there has to be a degree of trust that the mistake was genuine and it happened in the spirit of innovation and improvement – that it wasn’t due to carelessness or recklessness. Then we need to be reassured that the person has understood why the mistake happened and knows how to avoid it again. And sometimes it’s difficult to understand what has been the result of a person’s action and how much context or the situation in which they are working has contributed to the result. Let me remind you here of the attribution bias: the self-serving bias takes place when we look at the reasons of why we succeed and why we fail. We are likely to think that our success is due to internal reasons – like our abilities, or our behaviour – while our failures are more likely to be the cause of external circumstances. And guess what, when we look at other people, we often assume that their behaviour is the cause of internal circumstances, not of external situations and this is called the fundamental attribution error. So you can see how this complicates the situation of how we deal with a situation when we or someone else makes a mistake. But I have no doubt (although I have no proof) that this relationship with being able to fail affects our engagement at work. And we do talk about this a bit during our virtual coffee, when Lisette brings up playfulness, which, by the way, doesn’t necessarily have to do with being wacky, but with having some sort of freedom to experiment within boundaries. Because this is such a vast subject, I’ve included quite some links in the show notes. There’s a link to a PDF on how are range of companies are retaining talent, a link to how MetroBank looks at the subject, and there’s a link to a PDF by the CIPD, the UK professional organisation for HR and Learning and Development professionals, which talks about the locus of engagement. Which talks not only about what helps people be engaged at work but what they engage with. So we’re all different, we all connect with different things and different things make our life at work more pleasurable – or more difficult. So it could be that my locus of engagement – where I connect_- is with customers, that’s where I do my best work, in my interactions with them. Or it could be with my team mates , they are the ones who keep me interested. Or with my manager who I deeply admire, or even the point of engagement might be with my company’s products. But going back to my previous point about making mistakes and being able to experiment at different levels, you can see how this is relevant wherever I’m connecting with in the organisation.